Help solve today's biggest computing challenges with the new Intel® Xeon Phi™ processor – a bootable x86 CPU that achieves powerful performance from an integrated architecture while eliminating PCIe bottlenecks. With up to 72 cores, on-package memory, and integrated Intel® Omni-Path Architecture fabric, the Intel® Xeon Phi™ processor achieves highly efficient performance per watt while ...simultaneously maximizing your investment. With the Intel® Xeon Phi™ processor, code is optimized for a general-purpose architecture using open standards giving you flexible, portable, and reusable code into the future. 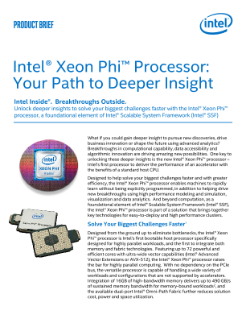 As a foundational element of the Intel® Scalable System Framework, the Intel® Xeon Phi™ processor brings your data center one step closer to exascale for all technical computing and machine learning workloads. Sandia National Laboratories discusses how Intel® Xeon Phi™ processors solve their Exascale challenges. CST’s Dr. Felix Wolfheimer shares how the Intel® Xeon Phi™ product family aids simulation performance.